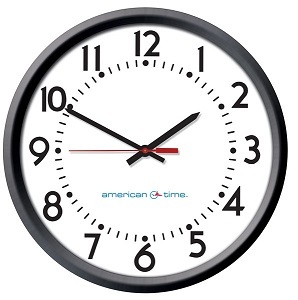 The American Time WiFi 5 Year battery powered NTP clock offers the simplest deployment, NO power and NO network point, options to secure the clock are available as well as FREE clock face logo option to customise clocks with corporate logos. via Wi-Fi client through web page interface. Supports DHCP or static IP addressing. time within 10 minutes of applying power. Automatically adjusts for Daylight Saving Time changes. or pool SNTP domain names. FREE clock face logo service to customise clocks with corporate or other preferred logo, security brackets available. clock function during a power outage.